We developed this product after consultation with heating engineers who were fed up with having to use several different additives to give complete protection to all wet heating and underfloor systems. After much R&D and extensive field trials, we launched the UK’s first eight-in-one additive for heating systems. 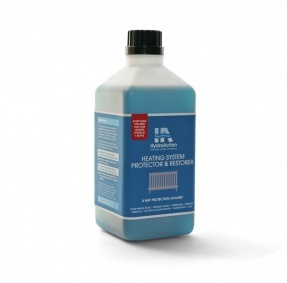 For a system that is blocked with limescale or sludge deposits, we would recommend a thorough Powerflushing first, then when the system is refilled a 1% solution of HydroAction Heating System Protector and Restorer. This will not only keep the system clean and working at optimum efficiency but also prolong the life of system components. Also available in 5 litre or 25 litre containers by special order.